…so when you are finally there, you don’t want to make any steps back. Since you’ve made your product multilingual already, let’s not forget about the vital part of any business – communication. While you read this sentence, simply recall: how much of a business material you exchange with your co-workers or partners via e-mail? How much are you lost when you paste the content translated into multiple languages in and out the spreadsheets and try to divide and attach proper materials? It would be much, much easier if you had everything in one place, where you can translate the content, the attachments and the e-mails themselves as well. Surprise, surprise! 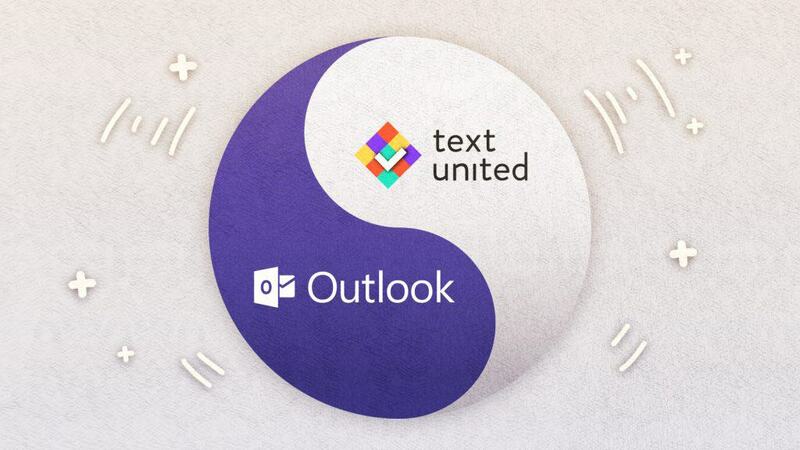 Text United is now directly integrated with Outlook, giving you Outlook Localization Plugin. What is it and how does it work? The add-in is optimized for multilingual companies that need a fast translation of any material in context. What does it do? It simply sends items straight from your inbox directly to Text United. Like this, e-mails can be translated quickly, using machine translation or professional human translators. We wanted to create a new kind of quality of workflow for email translation, but we wanted to keep it simple as well. That’s why, as innovative as it is, the Outlook Localization add-in stands for simplicity, too. The process itself starts with Translation projects being sent to our dedicated team of translators. Then, the content is machine-translated and edited by human translators. As machine translation doesn’t get the context of a text unit very often, human translators re-phrase and maintain the general message of the email content. Like this, the message stays the same, the translated text has the native touch that we all want and what you have is a cheap, efficient and quick translation delivered straight to your inbox. 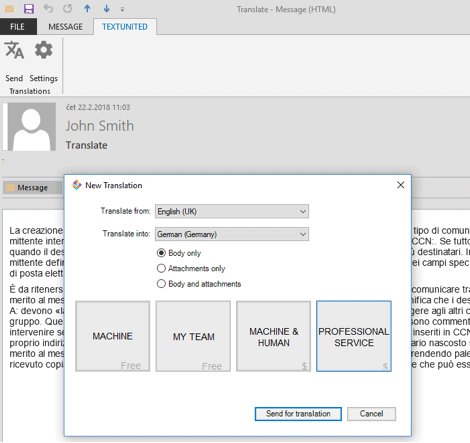 The add-in enables direct integration to your Text United company account, so you can choose the translators and team members directly in Outlook. After the content is sent for translation, a new project is automatically created in the system, where the translator can start working on the translation project immediately. When your team member finishes the task, the translated content is sent back to your inbox. After the translator finishes the translation, you will receive the translated email to your Outlook inbox. 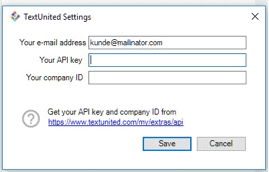 How To Connect To Outlook Localization Plugin by Text United? You guessed it – it’s super easy! To connect the plugin, simply obtain the API key and company ID on your API page when you log in to the Text United portal. Are You Ready To Change The Workflow For E-mail Translation?